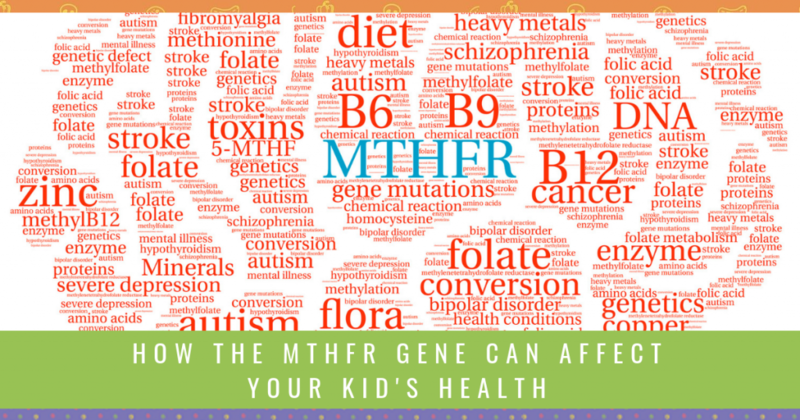 What on earth is the MTHFR gene, and why is it important to understand? You might have seen the term around on social media, but never quite understood it. Maybe some of the MTHFR symptoms you’ve come across sound familiar. Or maybe you or one of your children has been given a result, and you just don’t get it. Mutations of the MTHFR gene can have a wide variety of effects on health, and it can be quite complex to understand! But I’m here to make it as simple as possible. Watch the video below or keep reading to learn more about how the MTFHR gene could affect your family’s health. MTHFR is both a gene and an enzyme. The MTHFR gene is the gene responsible for producing the MTHFR enzyme. The MTHFR enzyme’s main role is converting folate into an active form that can be used throughout the body. Folate has many roles in health, but one of the most important is in a process called methylation. What does methylation do for the body? How does a mutation of the MTHFR gene affect someone’s health? It’s important to remember that MTHFR is not the only thing that leads to these health concerns. MTHFR is just one gene, so you need to treat it as one of the puzzle pieces that make up your state of health. What does a mutation of the MTHFR gene mean, anyway? Put simply, when there is a mutation, it means there is a change in the genetic sequence. Mutations in the MTHFR gene are quite common. There are two different areas that we look at in the MTHFR gene – C677T and A1298C. There are two spots on the gene that have been researched, and that we can get tested for. If you can remember back to your high school science, you’ll know that genes come in pairs – one from your mum’s side, and one from your dad’s. So if you have a mutation, you can be either heterozygous – have one copy of the altered gene – or homozygous – have two copies of the altered gene. How does this affect your kids if you have MTHFR? If you have one copy of either gene, there is a chance that you passed it on to your kids, but it’s not definite. If you have two copies of either gene, your kids will have at least one copy of that gene. Why does this matter? The number of copies can tell us how severe the mutation is, and how likely it is to have a significant impact on your health. It is important to remember that everyone is different, so how this affects you will be different too. How well you look after yourself in terms of diet and lifestyle can play a big part in how much a change to the MTHFR gene will affect you. Can’t we just supplement with active folate and leave it at that? Folate is an important part of methylation, but it’s not the only nutrient that you need to be aware of. Others include vitamin B6, B12 and omega-3s. That’s why working with a practitioner can help you to figure out which will benefit you the most. But there are also downsides to supplementing with methyl-folate, the active version of folate. There is such thing as too much of a good thing! If you take a dose that is too high for your needs, or if you are particularly sensitive to it, you could end up over-methylating. This can be just as much of a problem as undermethylation. If you are experiencing these after using methyl-folate, it may mean you need to reduce your dose, or come off it completely. This is why it’s essential to go back to your healthcare practitioner regularly – they can help you find the right balance for your needs. So in short – no. MTHFR is not a one-remedy quick-fix concern. How do you get tested for MTHFR gene mutations? The great news is that testing for MTHFR is easy and relatively inexpensive! To get tested, you can use either a blood test, or a swab. This makes it easy to get your kids tested. You do need a referral from a practitioner for testing. Some GPs do test for it, but it’s important to make sure they are testing for both C677T and A1298C. Otherwise, naturopaths, nutritionists and other integrative health practitioners can order the testing for you. It’s around $50, and is not generally covered by Medicare. However, in some states, if you already have diagnosed family members, testing is free. Check with your practitioner if you’re unsure. 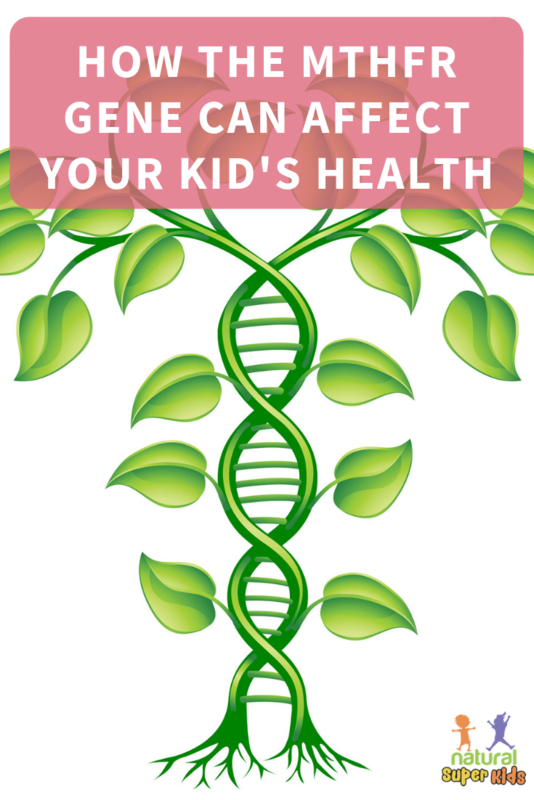 What are some symptoms of MTHFR gene mutations in kids? Again, MTHFR is not the sole cause of any of these conditions or concerns. But it can play an important role in them, so being aware of its impact is key. What can I do if one of my family members has the MTHFR gene mutation? The most important step to take is to work with a practitioner who understands MTHFR. Every management plan will be different, depending on their symptoms, state of health, diet, lifestyle and other genetic factors. But there are some action steps you can take today to support the process. Synthetic folate, or folic acid, is one of the worst things for someone with MTHFR issues. It is found in supplements, particularly in pre-natal supplements. If you have MTHFR and are pregnant or trying to fall pregnant, it’s essential to find a pre-natal with an active form of folate. Your practitioner can help you with this. But folic acid is also added to many foods we eat every day. Food manufacturers add it to products to make sure everyone gets enough folate. But people with MTHFR simply can’t metabolise it properly. Folic acid is typically found in grain-based products such as bread and cereals. If it lists folic acid or added folate on the label, give it a miss. Foods that have naturally occurring folate are an important part of managing MTHFR, so include lots of them! Some of the best sources of natural folate include spinach, kale, broccoli, avocado, lentils, chickpeas, beans and other legumes. Because people with MTHFR issues have trouble with detoxifying, it’s important to boost this up with antioxidant-rich foods. The easiest way to include these is by eating plenty of colourful fruit and vegetables. The brighter the better – think berries, beetroot, green leafy vegetables and different coloured capsicum. Many antioxidants are vulnerable to heat, so include some raw fruit or veg every day. Smoothies are a great way to include nutrient-dense foods, especially if your kids aren’t a fan of eating their vegetables. People with MTHFR can experience a variety of gut-related issues. A healthy gut is essential for absorbing nutrients and support the detoxification process. So make sure you’re looking to support a healthy, happy gut. To read more about gut health and how it affects health, check out these previous articles. We want to lighten the load of detoxifying, and an easy way to do this is to avoid chemicals and toxins whenever possible. There are countless sources of these, so don’t get overwhelmed. Start small – you might switch over to natural options for personal care and cleaning products, or reduce plastic use in the house. Inflammation can be a big issue for those with MTHFR, so we want to minimise the foods that can contribute to it. Gluten, dairy, soy, sugar and processed foods are some of the more problematic foods. It doesn’t mean you need to cut these forever. A practitioner can help guide you through the process of finding which foods are contributing to your symptoms. As we discussed earlier, everyone needs a different dose of active folate, and many will need other supplements to be at their best. Your current diet, lifestyle, symptoms and other genetic factors all affect your ideal dose and supplement regime. So make sure you seek advice from a qualified practitioner who works with MTHFR. Do you or your children have MTHFR issues, or would you like to get tested? As a naturopath with experience in MTHFR, I’m here to help. You can learn more about working with me here.